Give Anni Kupper 15 or 20 minutes of instruction time and you'll be juggling three balls. Anybody can be a juggler, it just takes concentration and patience, Kupper says. Kupper, who hails from Cologne, Germany, has joined the staff at The Circus Project as a coach, bringing a unique storytelling style of juggling. It's not just juggling clubs or balls, but it's a "charming" stage act with physical theater, dance and music. She'll be teaching at the Circus Project for three years. "It's using our technique as a form of expression," Kupper says. "It's not about a juggler being a good juggler; you don't ask them how many balls they can juggle, just as you don't ask a Shakespeare actor how many acts they do." Kupper hopes to teach dozens of students at The Circus Project, which has a big warehouse at 1420 N.W. 17th Ave.
She aims to teach jugglers that it's not about being a clown — just as the circus has evolved from being about animals and tandem acts. "Circus and juggling are our own art forms, used as a means of expression," she adds. Kupper attended the Portland Juggling Festival in 2016. She says Portland "has a lot of potential" as a juggling hub, as she hears jugglers have been moving to the city. The Circus Project has been home to students in many disciplines for 10 years. For adult beginners, there is Absolute Beginner Aerial, Aerial Fundamentals, Art of Clowning, Cyr Wheel, Handbalancing, Partner Acrobatics and Tumbling. For advance adults, there is Active Flexibility, Aerial Fundamentals, Chinese Pole, Contortion, Fabric, Handbalancing, Lyra, Partner Acrobatics, Straps, Trapeze and Tumbling. And now there'll be juggling. 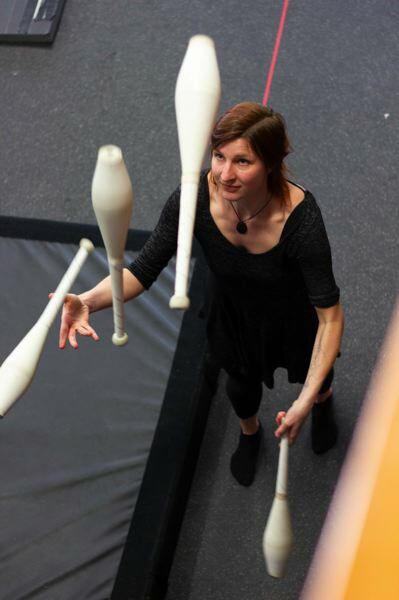 "We've had a handful of instructors through the years, and we're really excited to work with Anni," says Jacki Ward Kehrwald, Circus Project communications manager. "She has a unique style and philosophy. She's really a delight as a performer and coach." Kupper has performed in Japan, Singapore, Israel, throughout Europe and even Gabon in Africa. She'll perform at the Moisture Festival in Seattle this month. She likes the variety at The Circus Project, which Jenn Cohen started in 2008 initially as a way to help homeless and at-risk youth through circus arts. It expanded in 2009 to include classes for the general public. Says Kupper, of circus arts: "You're not just learning dexterity and coordination, but it helps to push your own boundaries. You're doing something that you might be afraid to do at first. But, it can help you grow in many ways." Ward Kehrwald and her husband, Nicolo Kehrwald, an instructor with The Circus Project, also are circus performers, having performed recently for the Acrobatic Conundrum and Cavalia's "Odysseo." The couple now lives in Portland. She's eight months pregnant. She's happy to be working with The Circus Project; years ago, before she and Nicolo went off to perform with traveling companies, she worked for Cohen in administration. The Circus Project, which recently earned a National Endowment for the Arts Works grant and Cirque du Soleil grant, had 1,700 students in 2018. "It's grown a lot since the first year having four students 10 years ago," Ward Kehrwald adds. For more on Kupper and The Circus Project: anni-juggling.de, thecircusproject.org.